Brockley Cricket Club started in the 1920’s with the advent of the charabanc and Saturday afternoons off for farm workers. The Rev Nettleship’s nephew was the prime mover in forming the club. The pitch was along the Hartest road next to Clockhouse farm. In those days all the surrounding villages had teams and great was the rivalry between Brockley, Rede, Hawkedon, Hartest and Whepstead. Brockley was famous for the large number of Boreham’s the side contained. On one occasion there were 10. However the star of the side was Ernie Pawsey, the village postman and black smith. The opposition used to get him so riled that he bowled faster and faster and wilder and wilder until the ball was bouncing over the wicket keeper’s head. He was a sort of early version of James McKinney. With the onset of the war the club was disbandoned. It restarted in 1953 with Alf Bishop as captain. The ground was an old meadow behind Mr Coe’s farmstead. Alf was a fearsome but indiscriminate hitter. His tenure at the crease was short but exciting. I think Alf could only have been in charge for one year before he was succeeded by Cyril Chalice whose captaincy lasted 15 years. During that time we played friendlies. It was also a period of transition as the old guard was replaced by a crop of very young, very keen, talented cricketers. A very youthful Kenny Boreham helped Brockley to their first cup final victory in the Wickhambrook Cup Competition in the early 1960’s by getting seven wickets. Great was the rejoicing that night! In those days scores were low, teas were frugal, we changed in a converted chicken hut and Cyril kept the ball shiny from one game to the next by applying liberal quantities of shoe polish. I can remember Harry Rose scoring the first ever century for the club during this era. In 1963 Mr Coe sold the turf on our ground and we had to move. In 1964 Mr Francis leased us our present ground. We had to put it down to grass and made mistakes preparing the square that are still being felt today! In 1969 Brockley entered the Suffolk League. There were only two Leagues at the time: the Premier and Division 1 with no promotion and relegation between the two. Ken Boreham took over the captaincy at the start of this more competitive era when match fees were 15p. We actually played some very strong sides during this period: Worlington, Lakenheath, Tuddenham, and Bury Railway Club all of which eventually got invited into the Premier League. In 1972 we were relegated for the first time in our history. We needed to win the last match of the season but Great Cornard called off. There was weeping and gnashing of teeth! However next year we won all our matches and were back where we belonged. KB’s time at the helm was noteworthy for a series of wonderful cup triumphs in the Drakard and Rowntree Competitions. We can all remember Mike Beloe’s triumphant on drive for six into the setting sun to win us the Rowntree Cup against the old enemy Nowton. In 1979 Dennis Fisher began his 15 eventful years as captain. This was a period of consistent success in the Suffolk League Division One. We were top of the league on four occasions and were the best village side in West Suffolk outside the Premier Division. In 1986 our playing strength led to the creation of a second team to play on Sundays. During these years Tony Spurling began at long last to improve the wicket with the help in 1988 of our most important purchase ever: a heavy motorised roller from Philip, which remained in use for more than twenty years. Facilities improved when three portacabins were purchased for a clubhouse and we were licensed to run a bar. Paul Martin has run the bar for the last 17 years – testimony to his great thirst! In 1987 Len Pawsey who had played for Brockley since its reconstitution in 1953 retired. How we missed him for his competitiveness, humour and character. Dean Sykes took over the captaincy in 1994 and remained at the helm for 9 years. A re-organisation of league cricket in Suffolk meant that promotion and relegation between leagues was now possible. In three years, Brockley progressed from the first division of the Suffolk Mick McNeil league through the Suffolk Intermediate and Premier leagues into division 3 of the Two Counties league. Rapid promotion stimulated another huge improvement in facilities: new changing rooms, a shower block, sightscreens and finally excellent covers that made us the envy of other clubs. 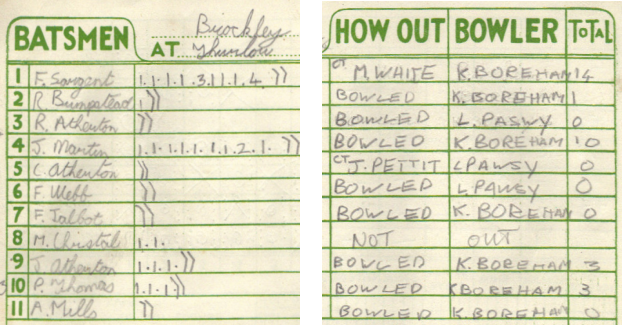 This period also saw a new flush of young cricketers and the gradual demise of the stalwarts from KB’s time. James McKinney took over the captaincy in 2003, and in his third and final year as captain, led Brockley into Division two of the Two Counties League – the highest league position the club has achieved to date. Stuart Fisher took over the reigns and following relegation, led the team back into Division two, before relinquishing the captaincy after 3 years at the helm. Ben Jeffrey captained the team between 2009 and 2010 as the club consolidated its position in Division Two. In 2010 we made our debut on Sky Sports (see below). This was also the year in which Joe Reed left the club. Joe was a prolific run scorer and wicket taker for the club, finishing the 2010 season with 807 runs and 36 wickets for the firsts. 2011 was a bitter-sweet year for the club. Having languished at the bottom of the table all season, a last gasp effort saw us beat East Bergholt in an epic winner-stays-up battle. Sadly, it was to be the last match John Wray watched. An avid supporter of the club, John passed away later that year. The club will play Whepstead in an annual fixture to celebrate John’s life.